Tell your Story was the focus and drive of RL’s programs, events, interviews and more in 2015. We believe that each of us has a different story, that if shared will inspire and connect our community. Beyond Workshop Series. 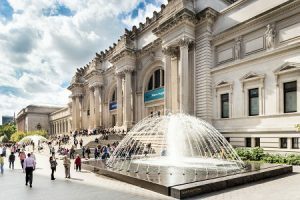 8 years providing training to over 700 artists in NYC and Latin America. A community of Artists growing together, overcoming fears, believing in themselves and becoming aware of the change they can create with their Art. 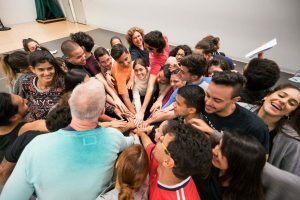 The BWS class of 2015 became a community of RL ambassadors throughout New York and Latin America after an inspiring month of free training at the National Dance Institute. Kids Beyond Broadway. 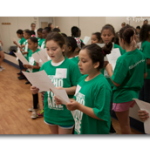 We took 25 campers from our 2015 D2GB Summer Camp to On Your Feet, The Story of Emilio and Gloria Estefan. They had the opportunity to meet cast members including Ana Villafañe who plays the title character Gloria Estefan. 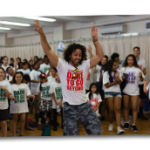 Choreographer Sergio Trujillo, who is a huge RL supporter, spent time with the kids reminding them that anything is possible if they continue Daring to Go Beyond. 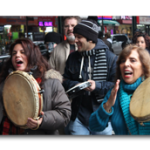 Collaborations.The Miracle Center, Broadway Meets Wall Street, People en Español, Hispanic Organization of Latin Actors (HOLA), Broadway Cares Flea Market, are among the many organizations we collaborated with this year. 8th Annual D2GB Children’s Performing Arts Camp Campers took classes with over 25 professional artists from the Broadway, film and T.V. industries and were guided by long time RL artist Matthew Steffens. 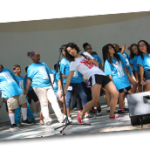 Over 400 applications received, 200 children participated throughout the 5 days receiving 64 classes in dance, acting, storytelling, singing and more. D2GB School Arts Program.This year RL took a break from its weekly school visits, but answered the call of individual visits when requested by the school. We look forward to reaching out to more schools in 2016. Videos, Blogs & Social Media. Our videos and blogs told the stories of artists who are following their dreams and making a difference. With the opening of On Your Feet, The Emilio & Gloria Estefan story we were honored to share the stories of Latinos on Broadway. We produced 4 special videos celebrating 10 members from the Broadway cast. Our TeamRickey Tripp, faculty member of Beyond Workshop Series led the program this year. Matthew Steffens led the D2GB Summer Camp, and Heather Hogan led some of the artistic projects and collaborations. R.Evolución Latina continues to be guided and directed by Luis Salgado and Gabriela Garcia. We want to thank our advisory board and our parent organization Broadway Cares/Equity Fights AIDS for guiding us through another year.Many thanks to all of the volunteers that support our mission and believe in what we do. Fundraising. 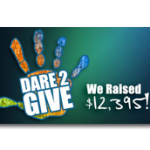 We continue to find new fun and active ways to engage our community in order to increase our donations and support. We are very happy with the results from our 2 main fundraising events of the year, helping us increase our revenue by 20% from 2013. RL’s Dance-A-Thon 2015This dance community event of 5 hours raised $26,800. Download our 2015 Annual Report and the Financial Statement for a complete list of events, facts and impact of our mission around the world.